On March 9, a three-judge panel of the U.S. Court of Appeals for the District of Columbia Circuit ruled, in Parker v. District of Columbia, that gun control laws imposed by the D.C. City Council, prohibiting possession of a handgun, and prohibiting keeping any gun assembled and loaded at home (the condition required for self-defense), are unconstitutional. The court agreed with the Supreme Court, the U.S. Court of Appeals for the Fifth Circuit, the Justice Department, the Framers of the Bill of Rights, and constitutional scholars past and present, that the Second Amendment protects a pre-existing right of individuals, not a so-called "right" of a state to maintain a select militia, or a privilege to have guns only when serving in a select militia. The court also ruled that individuals have a right to possess handguns. The panel`s decision overturned the ruling by the U.S. District Court for the District of Columbia, that the Second Amendment protects only a right to be armed while on active-duty in a militia. The city appealed the panel`s decision to the full Appeals Court, which allowed the panel`s decision to stand. The city is considering whether to appeal to the Supreme Court. The anti-gun Brady Campaign, which has provided legal assistance to the city throughout, has concerns about an appeal. Its president, Paul Helmke, said, "The D.C. law [is] a tougher one to get behind and defend. Why is this the one we`re going to be taking up to the Supremes?" "[T]he Second Amendment protects an individual right to keep and bear arms. That right existed prior to the formation of the new government under the Constitution and was premised on the private use of arms for activities such as hunting and self-defense, the latter being understood as resistance to either private lawlessness or the depredations of a tyrannical government (or a threat from abroad)." "[T]he phrase ‘the right of the people,` when read intratextually and in light of Supreme Court precedent, leads us to conclude that the right in question is individual." In the Second Amendment, "the most important word is the one the drafters chose to describe the holders of the right--‘the people.` That term is found in the First, Second, Fourth, Ninth, and Tenth Amendments. It has never been doubted that these provisions were designed to protect the interests of individuals against government intrusion, interference, or usurpation." "The Amendment does not protect ‘the right of militiamen to keep and bear arms,` but rather ‘the right of the people.`"
"The modern handgun--and for that matter the rifle and long-barreled shotgun . . . passes [the Supreme Court`s U.S. v. Miller] standards. . . . Once it is determined--as we have done--that handguns are ‘Arms` referred to in the Second Amendment, it is not open to the District to ban them." 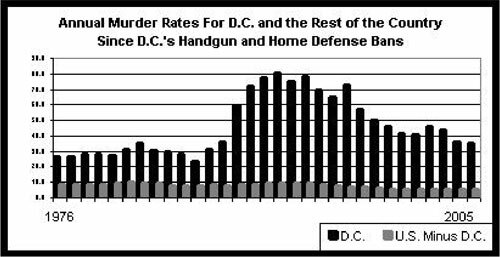 In 1975, D.C.`s City Council imposed a multi-faceted gun control law unlike any in America. The "Firearms Control Regulations Act" prohibited the possession of a handgun not registered with city police prior to Sept. 24, 1976, and prevented the legal use of a gun for protection in the home, by requiring that guns at home be "unloaded, disassembled, or bound by a trigger lock or similar device." The laws run counter to the 14th Amendment`s Equal Protection clause and Congress` intent in the Gun Control Act, which states, "[I]t is not the purpose of this title to place any undue or unnecessary Federal restrictions or burdens on law-abiding citizens with respect to the acquisition, possession, or use of firearms appropriate to the purpose of hunting, trapshooting, target shooting, personal protection, or any other lawful activity and that this title is not intended to discourage or eliminate the private ownership or use of firearms by law-abiding citizens for lawful purposes."